Chicken Corden Bleu just got easier and better thanks to this super easy casserole recipe. This is one of my favorite to go dinners on those busy days when I need to get something ready quickly. My kids love this recipe so much that some times I double it to make sure I end up with leftovers. 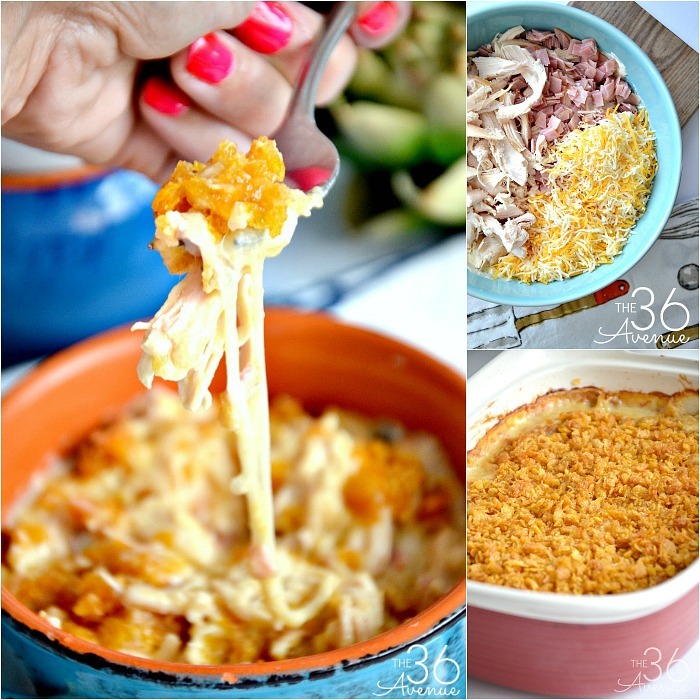 This is one of our family favorite casseroles for sure! I love cooking and sharing the dinner table with my family! Dinner time is my favorite time of the day! Let me tell you, I’m not a curvy girl for no reason! I LOVE TO EAT! In our home dinner time is the highlight of our day. We turn off the tv and phones during supper… This is the time when we get to hang out and talk about nothing and everything at the same time while we eat yummy food. Cooking is a huge part of our family… We seriously love a good meal! I can honestly say that this casserole is the mother of all comfort foods! This is one of those recipes that you can put together in 10 minutes and let the oven do the rest. I like to use rotisserie chicken from Costco, just because it is tasty and ready to go… Easy is always appreciated in my kitchen! Make sure to pin this recipe for later! It’s great for busy days, Sunday dinners, pot lucks and get togethers. My favorite thing about it is that you can make it and freeze it for later! I’m getting hungry so…Here we go! Melt 2 tablespoons of butter and coat the inside of a 11x7 baking dish. Remove the skin from a rotisserie chicken and shred 2 cups of chicken. Chop ham into small pieces. In a bowl mix the sour cream, chicken and mushroom condensed creams, salt and onion flakes. Don't over mix, you want this mixture to maintain a thick creamy texture. 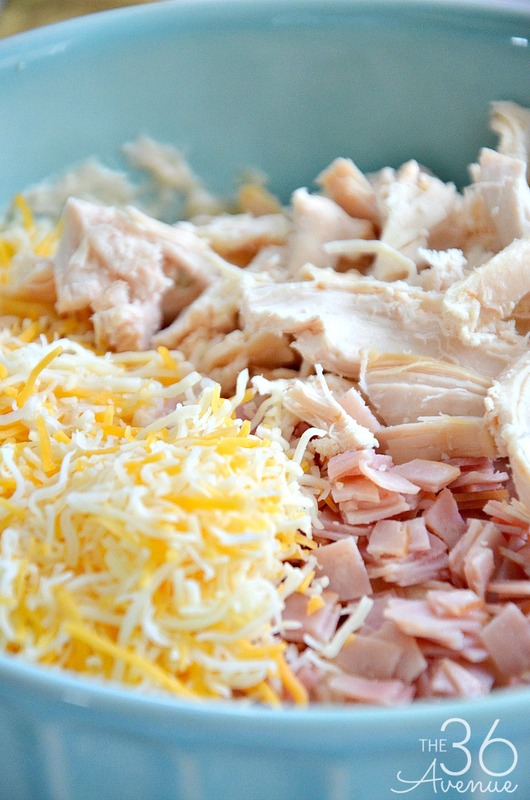 Add the chicken, ham, and 2 cups of shredded cheese. 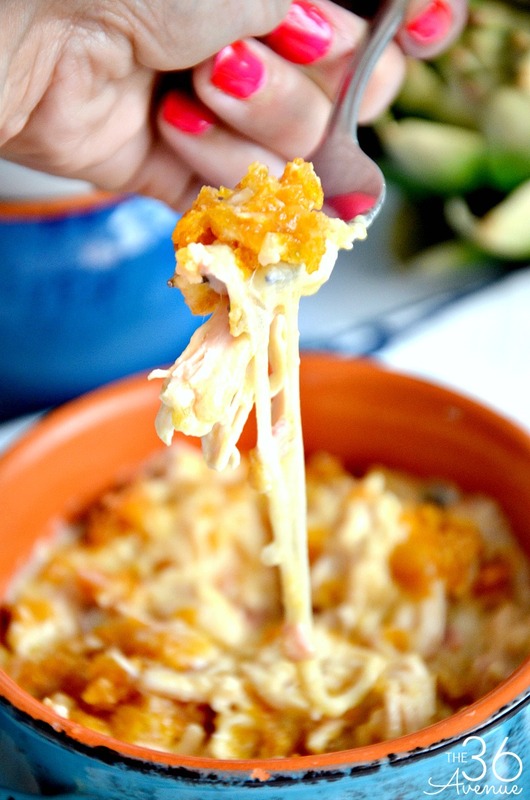 Mix until the chicken, cheese, and ham are coated. Put the mixture into the baking pan. Crush the cornflakes in small pieces. Melt butter and combine cornflakes and butter. Sprinkle evenly over top of casserole. Bake at 350 F for 40-45 minutes or until heated and bubbly. Let it sit 5 minutes before you serve. I really hope you give this recipe a try and even more I hope your family enjoys it as much as we do! Before you go I have some more yumminess for you! 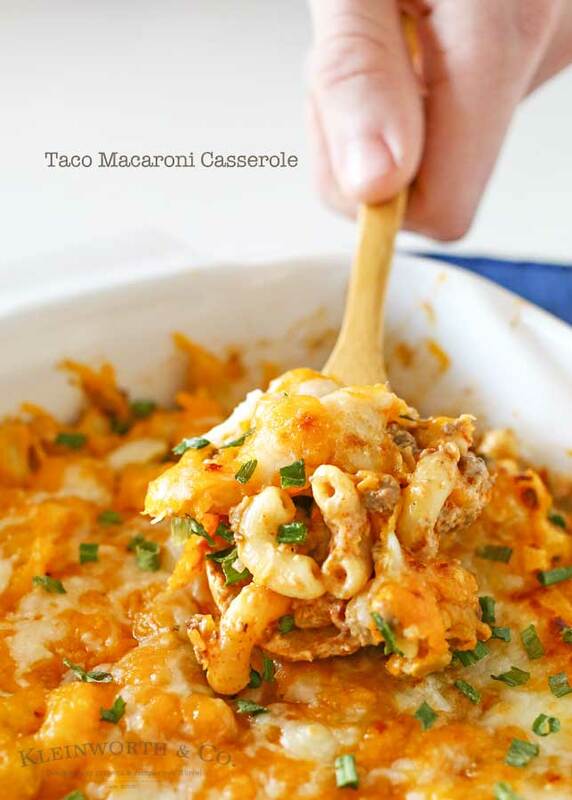 This Taco Macaroni Casserole has all the flavors of your favorite taco: beef, seasonings, salsa, sour cream… Yep, it’s all in there! If you love spinach artichoke dip for sure you are going to enjoy this easy and yummy chicken recipe! That’s all for today BUT make sure to subscribe so you don’t miss a thing tomorrow! Thank YOU so much for being AWESOME and hanging out with me today! Nope… What you see is cheese!